Omar Alghabra said he is a "proud Canadian." 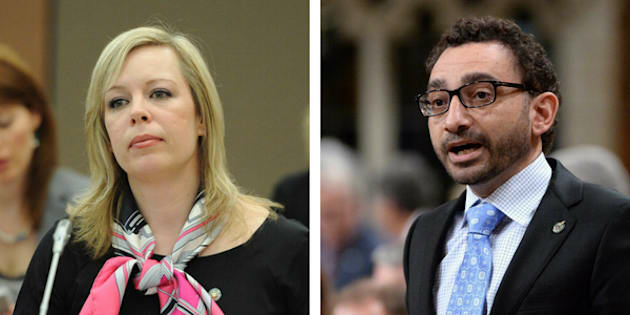 Senator Denise Batters (left) said a CBC Power and Politics host should have spoken with MP Omar Alghabra about his birthplace. A Conservative senator has apologized after facing harsh rebuke on Twitter for insinuating a Liberal MP's birthplace might affect his judgment on a Canadian diplomatic crisis. Sen. Denise Batters said she wanted to clarify comments she made about Liberal MP Omar Alghabra's appearance on CBC's "Power and Politics" Wednesday and suggestions she made about his place of birth. Alghabra appeared on "Power and Politics" to discuss how Canada's ongoing spat with Saudi Arabia might affect London, Ont. manufacturers who are building light armoured vehicles for the Saudi government. Alghabra, who is also the parliamentary secretary for Foreign Affairs Minister Chrystia Freeland, said he didn't have any information on the status of the deal, and spoke instead about the Liberal government's foreign policy of being vocal about human rights. Batters had criticized the interview in a tweet, and said host Vassy Kapelos should have asked him about his birthplace of Saudi Arabia instead. Alghabra tweeted back, saying he's a "proud Canadian" who has been consistent in defending human rights. Batters later replied that she meant no offense, and that she simply thought Alghabra had a "unique perspective to offer." But many on Twitter accused Batters of bigotry, including fellow Liberal MP Adam Vaughan, who said she should apologize and that Tory Leader Andrew Scheer should expel her from caucus. This is beyond offensive. Shame on you. You do not represent the best of this country and have no business being in the Senate with bigotry. It's this type of foolishness that makes me support abolishing the senate. Tory backbencher Blaine Calkins responded to Batters by sharing a screengrab of a 2005 blog suggesting Alghabra was an "Islamist." The Liberal fired back at Calkins by saying he expected "this type of garbage from an online troll or bot not an MP." The Tory MP later deleted the tweet and apologized for his "poor source," saying he was "unsure" about what he was reading. Alghabra is of Syrian descent but was born in Al-Khobar in Saudi Arabia. In an interview with The Globe and Mail last year, he said he was known as a Syrian while in Saudi Arabia, but in Syria he was known as a Saudi. "And in Canada, I'm a newcomer as well," Alghabra said. "All of my life I've lived in some form or another as the other." Spokespeople for Alghabra said there would be no further comment. The MP later tweeted that he accepted Batters' apology and told her that this "was a lesson for all of us."